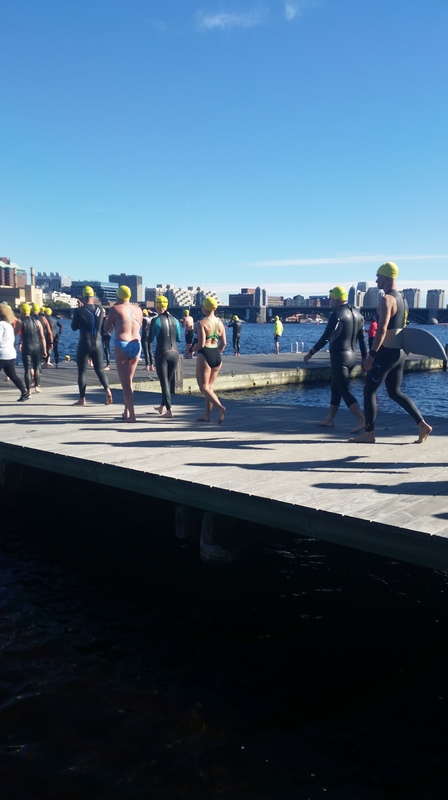 But then I found out about the annual Charles River One Mile Swim and quickly signed up. What better way to get over my lingering river issues? 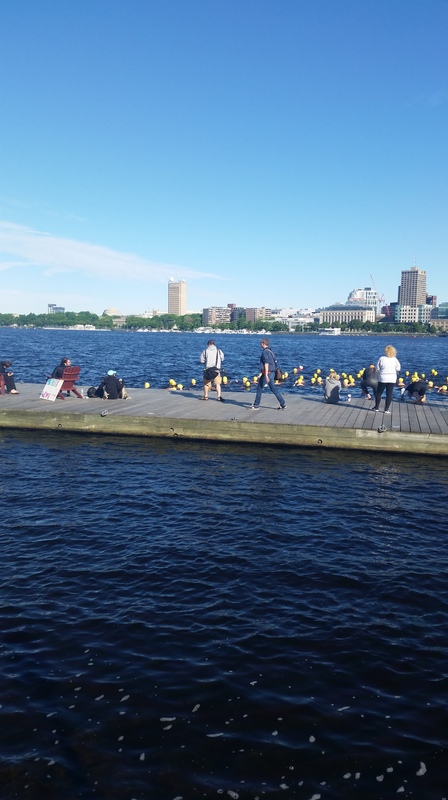 The race is in its 9th year and is run by the Charles River Swimming Club, in cooperation with the Charles River Conservancy and the DCR. 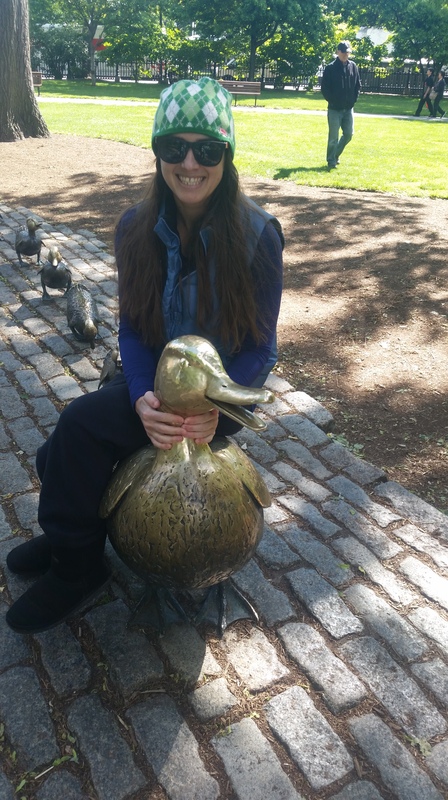 It starts by the Hatch Shell on the esplanade and the course is a clockwise diamond between the Harvard (Mass Ave) and Longfellow Bridges. On the morning of the swim my Support Crew (aka parents and bf) and I parked over by Boston Common and it was a short, easy walk to the start. Check in was quick and I had a lot of time to stand in the sun, catch up with friends, and go through varying stages of panic at my preparedness. You know, the usual. At a few minutes to 8:00am I joined the first of two waves and walked down to the start dock. We all jumped in and treaded water until someone shouted “Go!” and then we were off! Being a mass water start, it was a little chaotic for a few minutes, but I did my best not to kick or be kicked in the face and having succeeded at that, I’d call it a success. 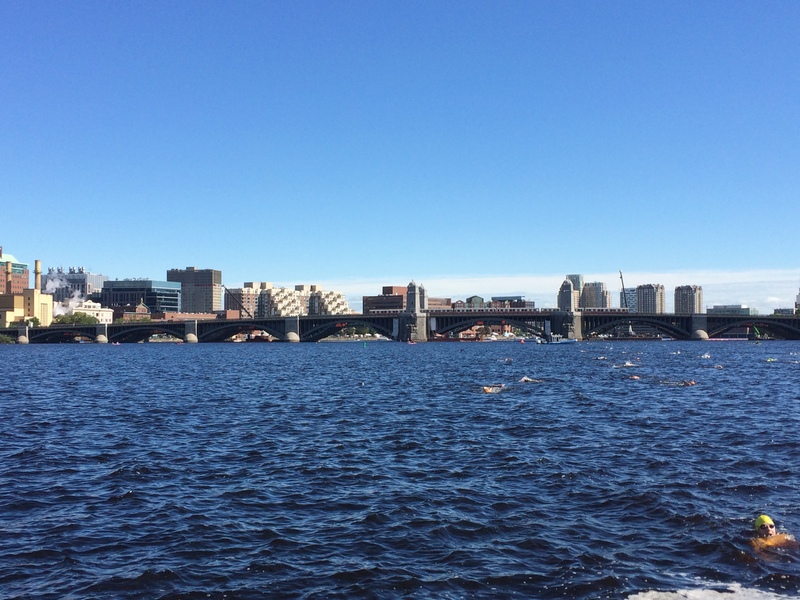 The first leg had us swimming towards the Mass Ave Bridge, and one of the coolest things was looking up to breathe and seeing the Prudential Center get closer and closer. 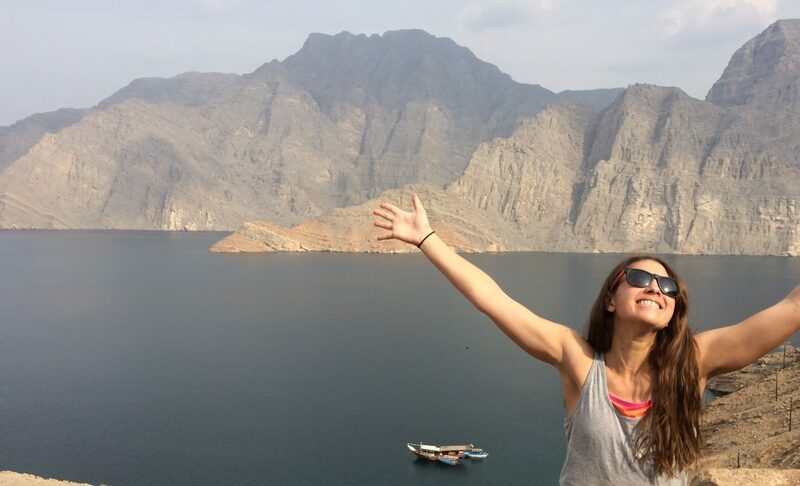 I spent some time contemplating the general murkiness (the verdict: no worse than other bodies of water I’ve been in) and singing to myself (Selena Gomez’s It Ain’t Me, for the win). It stayed fairly crowded for the first leg, but after the first turn, things opened up a bit and it was smooth swimming to the next buoy. The third stretch was hard in that we were swimming right into the sun and it took me awhile to find the buoy. I was also a touch distracted by someone who inexplicably insisted on swimming right on top of me, even though by that point everyone was pretty spread out. Necessary to touch my foot every stroke? Not so much. As a result, I overshot the buoy a little bit, but managed to get myself back on track fairly quickly when I realized. The final stretch was the hardest for me. I found the water a little choppier in that stretch – just enough so that it was hard to fall into a natural rhythm. But by that point the dock was in sight, so I just kept on and tried not to swallow too much water. The dock had a giant sensor on the end, so I just had to hit it with the hand that had my timing chip and I was done! I climbed up the ladder back onto the dock and was engulfed by my family and friends. There was coffee and food available after as well as, most importantly, “I swam the Charles” stickers, which you can bet I will display proudly. 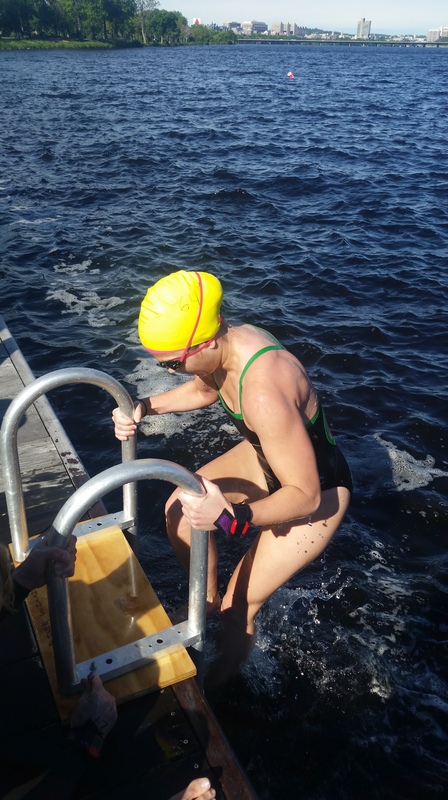 In the end, I finished in 33:20, about a 1:55 pace – a bit slower than I wanted, but not far off and solidly middle of the pack – certainly not bad for the first open water swim of the season. I would absolutely swim this again. The water was cooler than most years (around 65) but I was fine without a wetsuit and the event was so well run – friendly volunteers, plenty of pre-race information, lots of safety provisions (water quality checks in the days leading up to the race, lifeguard, kayak and boat support on the day of, an organized post-race check in process and optional Mylar blankets), and excellent support from start to finish. 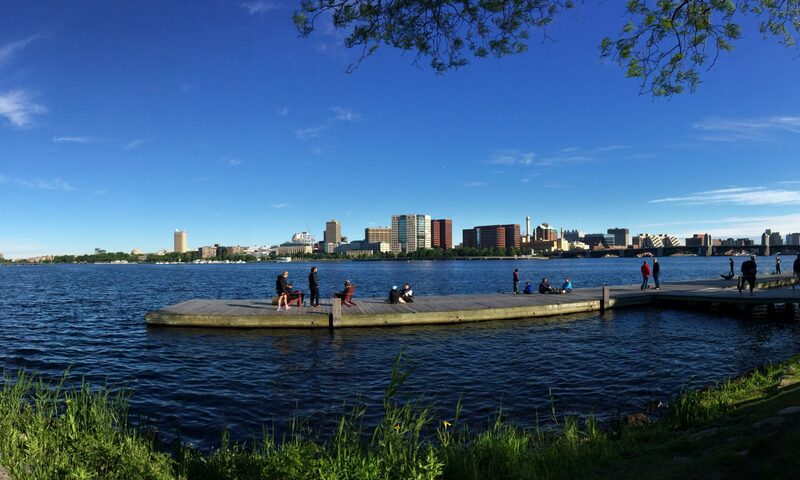 Around this time last year I was on a SwimTrek vacation, and while I can’t say that the Charles River necessarily compares to the fjords of Montenegro (what does? ), there’s something about open water swimming that I find so relaxing. The water is my happy place, and I am thrilled to have found that same vacation feeling so close to home and in such an unexpected place. 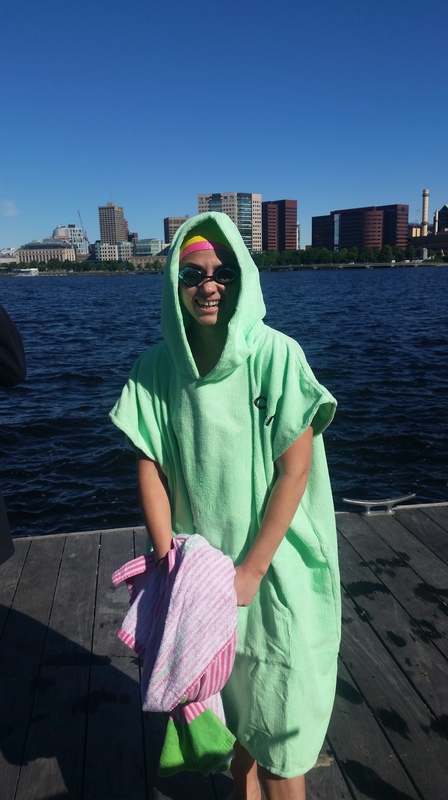 Having been submerged and spent 30+ minutes in it, I can confirm, without question, that I truly love that dirty water, and am happy to call Boston my home.